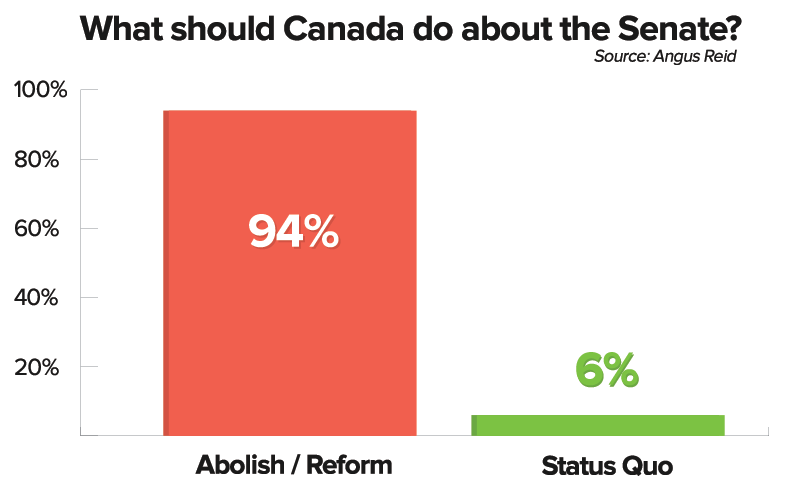 On the other hand, 94% of Canadians say the Senate should be reformed or abolished altogether. 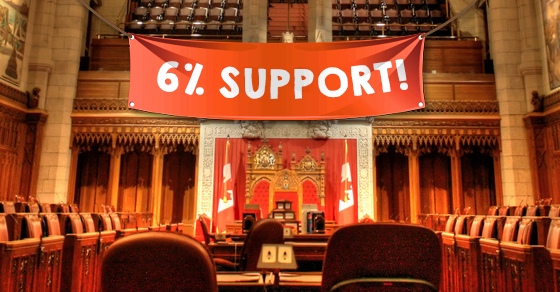 But back to the 6% of Canadians who support the status quo: come on guys, really? Seriously? Senators actually face mandatory retirement at age 75, but you get the drift. Unlike the House of Commons, the Senate is an unelected body and even though they have the power to overturn legislation (which they do), they don’t have to explain their votes to anybody. Once appointed, senators earn a $145,400 per year base salary regardless of whether they do good work or even bother showing up for their job every day. Constitutionally, senators can only be removed from the Red Chamber for offences like “treason” or “adherence to a foreign power”. Stephen Harper liked to claim “the Senate is an independent body,” but not too many people believed him. 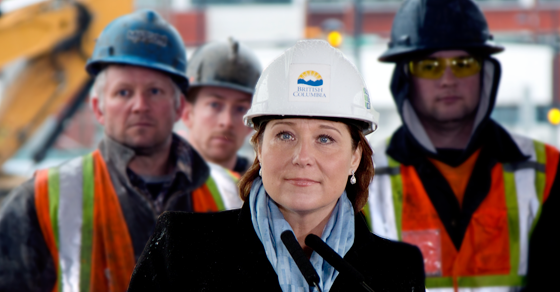 Plus, there’s all those senators who conspired with the PMO to sweep the Duffy fiasco under the rug. And Duffy, of course, was so “independent” he regularly appeared at partisan Conservative fundraising events. Justin Trudeau promised to make senators independent by kicking Liberal Senators out of the Liberal Senate caucus, but they changed their name from the “Liberal Senate caucus” to the “Senate Liberal caucus,” they continue to support Trudeau and they still attend Liberal Party events. Add to that Trudeau’s chief representative among these “independent” senators appointed a whip this week whose job, presumably, will not be to enforce party discipline among the independent “Senate Liberals,” even though that’s what a whip usually does. Because they’re “independent” Senate Liberals. Confused? Good! Of course everyone in Canada knows about Senator Duffy. Then there were all the senators that worked behind the scenes to keep the lid sealed on the Duffy fiasco. And let’s not forget Senators Wallin, Brazeau and Harb. Before them, there was Senator Raymond Lavigne, who was suspended from the Liberal Senate caucus after inappropriate expense claims, though he continued to spend taxpayer money on travel, hospitality and office expenses on top of his salary before finally being convicted of fraud. Senator Nancy Ruth was also upset about the prospects of being forced to eat “ice-cold Camembert with broken crackers” after auditors looked into her expense claims. And those are just a few examples among many to choose from. So there’s a couple of things to think about, you 6%ers, wherever you are out there!